For a true Southern bar with all the fixin’s, head just across the state line into Florida to Hub Stacey’s At The Point. 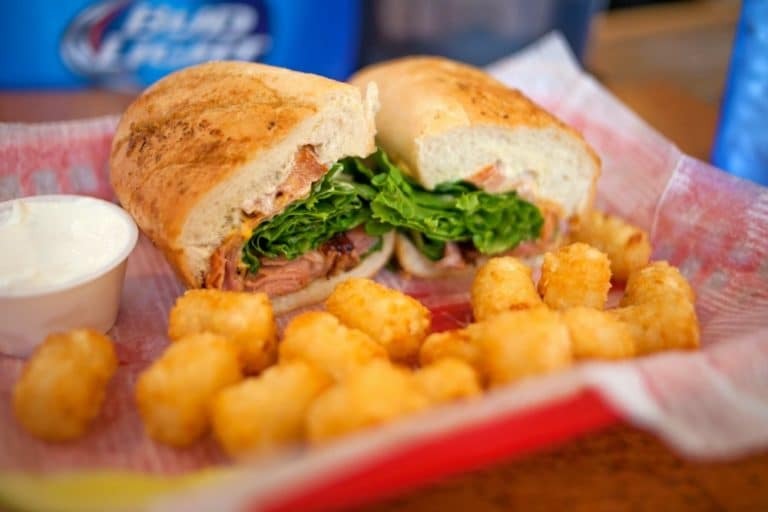 This little shanty on Perdido Key has a distinctly casual Southern style, with a laid-back appeal and sandwiches like ya’ mama used to make … only better. 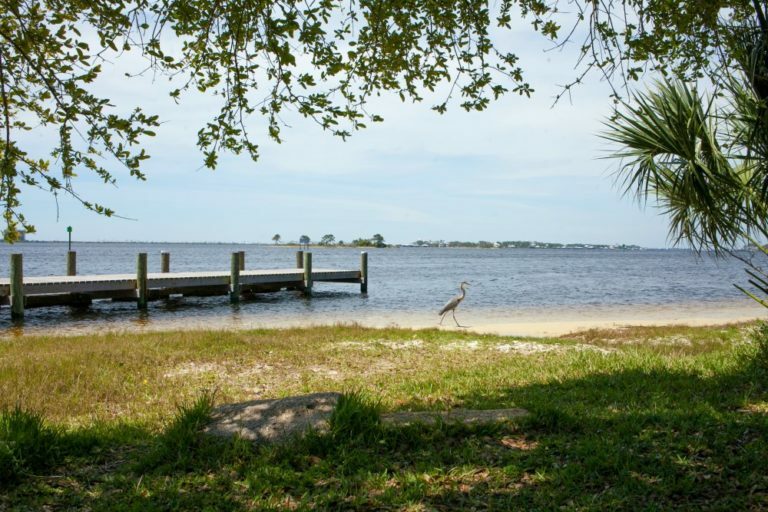 The wooden building with a wraparound deck is tucked away under sprawling oaks and magnolias, adjacent to the Galvez Landing boat ramp and docks, where you can spot local wildlife – including rednecks and blue herons. Back to the bar, it’s full. Both of your favorite libation and, generally, of a happy crowd. Brooklyn the Bartender recommends either The Gulf or The Galvez sandwich, each listed under Local’s Favorites. We went with The Gulf, which, contrary to its name does not contain any seafood. Instead, it is piled high with lean tender ham and grilled with “good OLE’ American cheese” melting from within a hoagie roll. Next, they top it with lettuce, tomato and just a touch of dill mayo, which according to Brooklyn is the best thing since regular mayo. All sandwiches come with either potato chips or potato salad. For an upcharge, you can choose from fries, tots or a side salad. We got the tots, because … TOTS. In addition to the delicious deli-style sandwiches, you’ll find burgers, fried items and homemade chicken salad loaded with onions, celery, apples, grapes, pecans and seasoned mayo. It’s unpretentious pub fare in a setting that’s equally unfussy. There’s plenty of seating indoors and out for smokers and non-smokers. 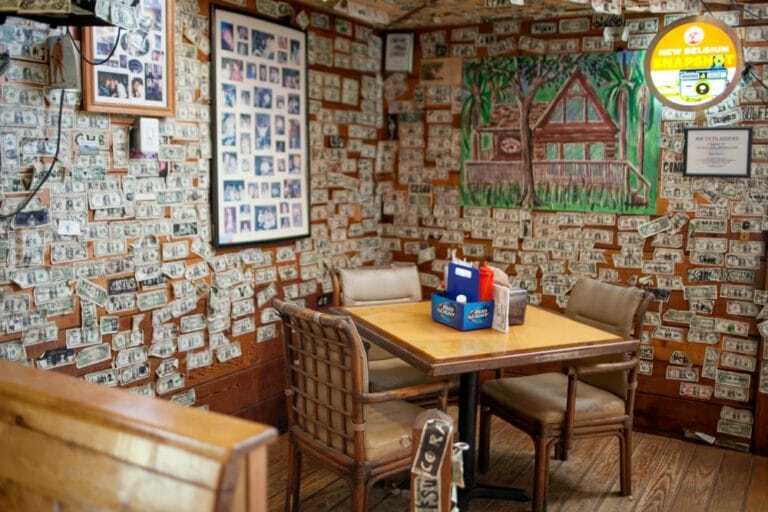 Signed dollar bills line the walls, so bring in your singles and ask for a Sharpie to leave your mark. Hub’s has live music five days a week (all except Monday and Tuesday). The fully stocked bar offers happy hour specials from 11 a.m. to 7 p.m. That’s 50 cents off domestic bottles, house wines and well drinks. Into singing in front of strangers? Visit on a Saturday for a rowdy night of karaoke. You’ll think you’ve died and gone to Alabama. 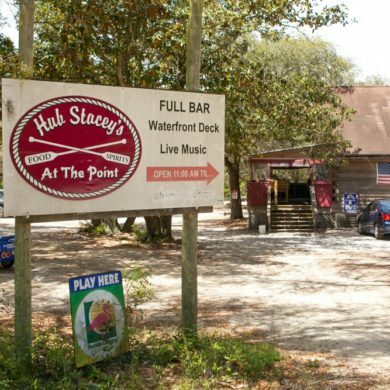 Hub Stacey’s At The Point is located at 5851 Galvez Road in Perdido Key FL. For more information, visit the Hub Stacey’s website or call (850) 497-0071.